Mixing up my skincare regime makes me nervous. Now that I've found the routine that works for me and my skin is the best it's been for years, I always hold my breath when trying a new product. But, like everyone else in the beauty world, I'm constantly searching for something that will make my face more glowing, more even-toned and clearer than ever, y'know? So, when I was sent the Pharma Nord Q10 Revitalizing Day and Night Creams*, I thought I'd give them a go. Admittedly, having never heard of Pharma Nord before, I had my reservations about this duo. It's no secret that I have a penchant for high-end skincare from well-known experts; bottles from Sarah Chapman, Sunday Riley, Oskia and Zelens line my bathroom shelves. But, my favourite moisturisers have almost always been from less fancy, no-frills brands. After receiving this Q10 set, I've used them solidly for the past, few weeks and I've been pleasantly surprised by the results. This skincare pair is actually aimed at those who are more mature and concerned with ageing. Pharma Nord claim that these creams could reduce the depth of fine lines and wrinkles within eight weeks. Impressive, right? Although I'm probably not their exact, target market, now that I'm heading towards my late-twenties and my skin is quite dry, I'm starting to notice slight lines developing, around my eyes especially. Reversing the signs of ageing isn't my biggest concern, but I'm definitely becoming more interested in products that will help to prevent more creases from establishing themselves on my face, too soon. Between my brows, a faint furrow has decided to set up shop. 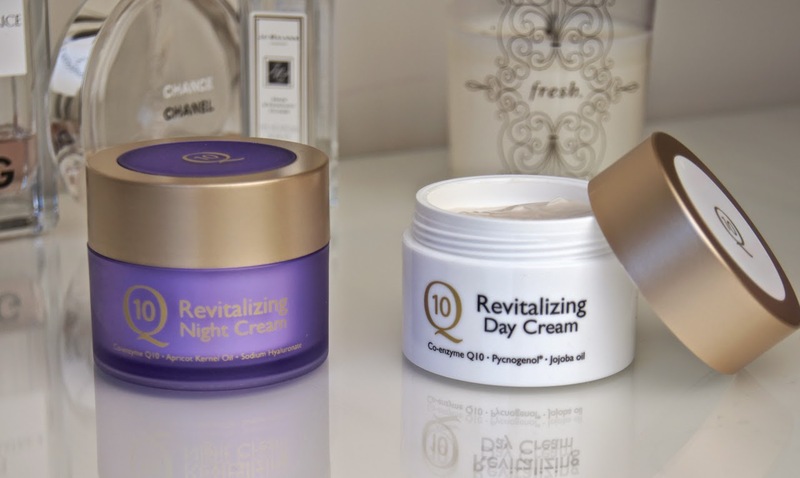 Without thinking I'd notice much of a change, I slathered on these creams and expected that they'd make my face feel softer and more hydrated, at most. Lo and behold, I would actually say there's already a reduction in the prominence of my unwelcome, frown-line friend. It may only be slight so far, but I can well believe that the groove will be smoothed out further, as I continue to use these creams. I will definitely keep you updated on my results! Targeted at addressing the problems of dry skin and loss of collagen, the Day Cream is infused with a cocktail of natural, anti-ageing ingredients. Of course, there's the Co-Enzyme Q10 in there, which the brand widely use in their products and promotes effective skin-cell repair. Pycnogenol, a product derived from the bark of a pine tree, supports the body's production of collagen and boosts the natural defenses of your skin. To give the cream it's wonderful, moisturising properties, they've harnessed the power of natural oils including Jojoba and Apricot Kernal Oil, which are full of vitamins and fatty acids essential for healthy cells. 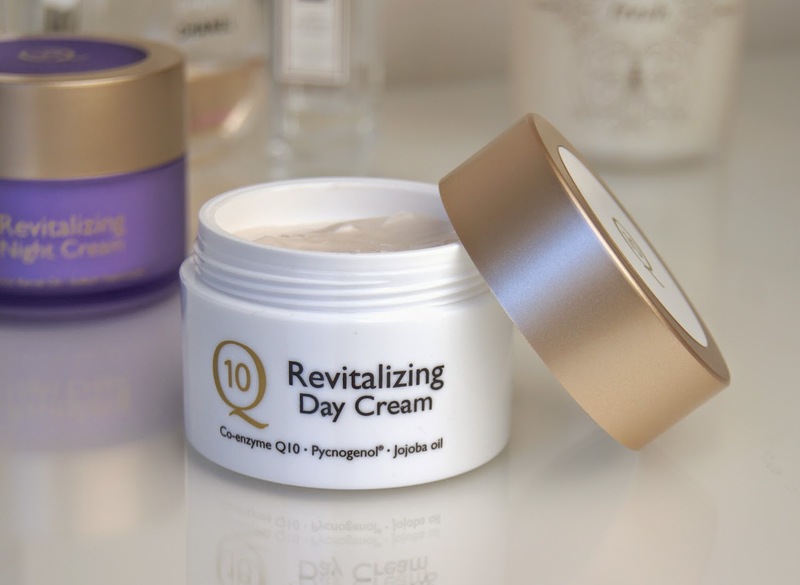 Texture-wise, the Q10 Day Cream is hydrating and creamy, but feels light and absorbs straight away. Although aimed at those with dry skin, it doesn't leave behind a greasy, shiny residue or tacky feel, so I can imagine it would also suit those with more normal or even oily complexions, to balance out excess sebum-production. Providing a smooth base for makeup, it helps any makeup you apply over the top to sit really well, without causing it to slip around and slide off half-way throughout the day. For the upcoming, warmer months, this will continue to be my day-time moisturiser, but I do feel that I'd personally need something richer, during Winter. My only qualm about the cream, is the floral scent of it. Fortunately, the fragrance dissipates once applied to the skin and it hasn't stopped me from reaching for it. 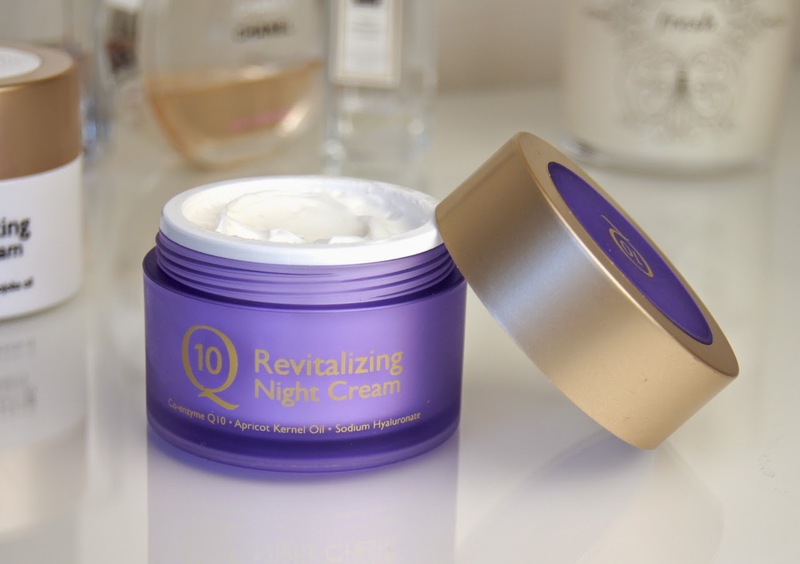 To help the skin regenerate and repair itself as you sleep, the Night Cream is also packed full of Co-Enzyme Q10, along with a whole host of nurturing ingredients. Shea Butter and Castor Oil provide an abundance of vital moisture, whilst Sodium Hyaluronate helps the skin to retain it. Out of the two products, the night cream is the stand-out for me. Until now, I've always use the same moisturiser (if I skipped an oil step) as part of both my morning and evening routines, but I can definitely see the reason for switching them up and I'm a convert. Smoother and richer than the day-time formula, this one has more of a luxurious feel to it. Immediately, it soothes the skin and delivers a generous dose of hydration, which leaves it looking juicy and glowing. On waking in the morning, skin feels so soft and plumped. I've been more willing to venture out of the house sans makeup, let's put it that way! Although thicker in consistency, the cream still sinks in quickly and isn't too rich that the skin is overloaded and pores become blocked. Like the Day Cream, this has a scent to it, but it's a fruity fragrance that I actually quite like. I tend to be wary of moisturisers that contain strong fragrance, in case they irritate my skin or break me out, but neither of these creams have done so. Priced at a very affordable £25, this moisturiser set is an absolute bargain for an anti-ageing product. Even if you aren't interested in anti-ageing products just yet, these creams are just so lovely to use and leave the skin looking and feeling gorgeous. For me, the fact that they could decelerate the development of lines and wrinkles is just a bonus. I love the simple design of the packaging and, as they're plastic, the jars are lighter and better for traveling with. Containing 50ml of cream each, a pot should last for around six months, making them even better value. Which moisturiser do you currently use? Would you give Pharma Nord's Q10 creams a chance? You are a tru beauty! I really like this post, since i am getting older now, i need to start taking care of my skin, so i will certainly give this a shot if i can find it! I dont sleep enough or well enough so i get bags under my eyes... I really need to start taking better care of my skin! Thanks for the reminder! you are the best! I'm new to your blog and I really like the way you describe products. A very in depth review and still a pleasure to read! I haven't heard of the brand before but it sure sounds promising. Thanks for sharing! I really enjoyed reading this detailed review; it sounds like they really are great products and a bargain if you can get them both for £25! I especial;y like the fact it leaves a smooth base ready for makeup, I always find some moisturisers actually make it harder to apply makeup. Wow, the packaging looks really luxurious - I really thought it was glass! I have very dry, sensitive skin so I was wary when you mentioned that they're fragranced, but that's good that they didn't break you out! Really in depth, well-written review! Wow, this post is one of the best ones you've ever written! I love it <3 More please!